While the award-winning Chicago Board of Trade Building™ holds a special place in the architectural history of downtown Chicago, it’s clearly vital to the city’s future too. GlenStar Properties’ recent $30 million building renovation and subsequent 20-year contract renewal with Enwave Chicago, provider of chilled-water service, confirm its long-term vision. “The North Building, which was originally built in 1930, is a magnificent example of Art Deco architecture and design,” said Dennis Lambert, vice president and general manager of GlenStar Asset Management. “Glenstar has added a robust package of modern amenities including a 10,000-square-foot fitness center; a 5,000-square-foot state-of-the-art conference center; and a game room that is adjacent to a new rooftop deck with sweeping views.” All of these areas require round-the-clock space conditioning. 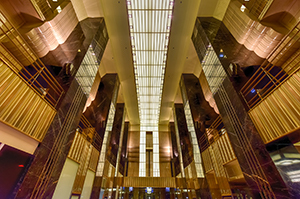 Congratulations, Chicago Board of Trade Building, on a stellar renovation. It’s an honor to serve such a historic structure. 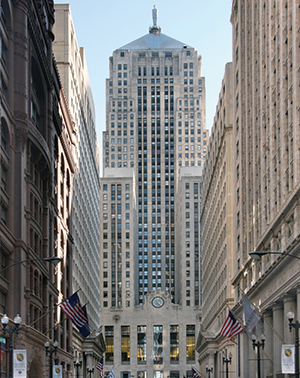 Learn more about the Chicago Board of Trade Building. Exterior photo courtesy GlenStar Properties. 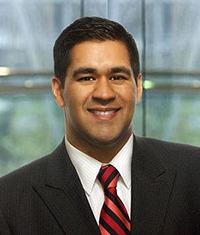 Carlyle Coutinho, Enwave Chicago’s new president and chief operating officer, is also the president and chief operating officer of the North/East Region of Enwave, which encompasses the Chicago and the Toronto and Windsor, Ontario, energy businesses. He joined Enwave in 2013 as chief financial officer in Toronto and has been responsible for raising more than $600 million in debt capital for North American business, developing and implementing strategic organic growth initiatives, and integrating all new acquisitions. Prior to joining Enwave, Carlyle held various senior level positions in private equity and debt investment firms based both in the United States and Canada, as well as in public accounting with KPMG and Deloitte. Carlyle earned his Bachelor of Business Administration degree from Wilfrid Laurier University in Ontario and is a Chartered Accountant and Chartered Financial Analyst Charterholder. Carlyle may be reached at CCoutinho@enwave.com. 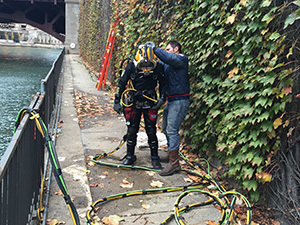 Just over a year ago a team of divers braved chilly temps to increase the surface area of two 36” intakes that draw Chicago River water into our P-5 Plant at 330 N. Wabash. They performed the same task again this fall at our P-4 Plant at the Merchandise Mart in compliance with the new EPA Clean Water Act 316(b). The modified surface area will help reduce potential fish impingement and entrapment. Individual buildings and Enwave Chicago have long used cold river water in place of cooling towers, absorbing heat from chillers. While non-customer buildings also need to comply with the new regulation, Enwave Chicago customers don’t need to add that to their to-do list. We’ve got that covered. A four-member team handled the job at our P-4 Plant. Two divers were in the water, with one doing the work and one serving as spotter. A third diver delivered tools to and from the surface and ensured their lines were clear. A fourth team member was located inside our plant using a “mission control” to view the live camera feed of the work performed, provide the divers with guidance, and activate the underwater torch for welding. It’s our job to handle all cooling system updates, upgrades and maintenance, relieving our customers of time-consuming and often costly overhead projects! Your customer portal is your information connection to Enwave Chicago. 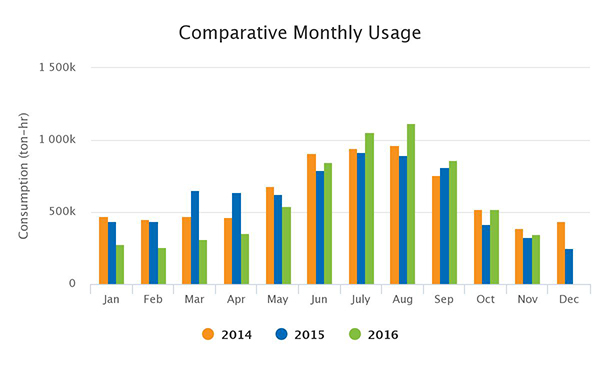 Through the portal you can view your current Enwave Chicago invoices; review, compare and download graphs of your chilled-water consumption (see below); and track your annual peak loads. If you’re not sure how to access your building’s customer portal via Enwave Chicago’s home page, email Jim Rylowicz. He will provide your account number and password information. Jim may also be reached at 312.447.1600 ext. 17.